Kent Sliger, owner of Blue Water Tackle out of San Diego, California, nailed this 378-pound boar with his .270 Winchester after guide Darby Neil jumped it out of the brush near a favorite waterhole on the Jack Ranch. It took two excellent, running shots through the boiler room to stop it. Both Federal Premium bullets were perfectly expanded and totally intact after passing through the hog and found buried in the armor plating on the opposite side. 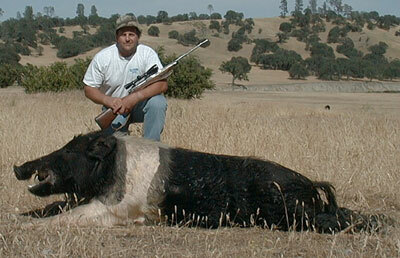 The tusks measured 4 1/2 inches.This was Kent's first hog hunt.